Unique reversible pet bed. Simply flip it inside out to create 2 colour options in the one bed! 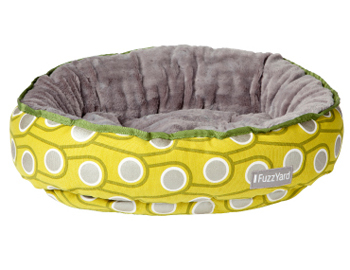 Containing FuzzYard's feather-soft filling & finished with durable yet velvety plush on one side (warm in Winter) and fashionable canvas (cool in Summer) on the other, the reversible pet bed is the ultimate in 'donut technology'. Available in the Lime/Grey or Black/Grey. Don't forget to check out the matching bowls!